The pathway through the Deer Moat forms part of a more comprehensive plan to build an alternative access walkway from the Vltava river to the grounds of Prague Castle. An initiative of President Václav Havel, the first stage of the project was completed in the spring of 1999. The pathway allows visitors to reach the Lower Deer Moat via stone terrace walls along Chotkova Street. It then continues along the Brusnice stream below the bastion that originally covered the renaissance Powder Bridge (Praný most) and subsequently to the walkways of the Upper Deer Moat. 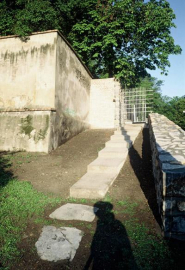 It is thus possible to reach the rearmost part of the Upper Deer Moat, the area of the so-called Pheasantry (Baantnice), or the north gate of Prague Castle. 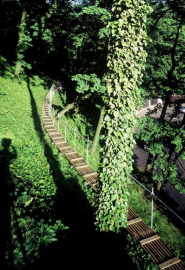 The aim of the entire project is to facilitate movement of pedestrians along the whole length of the Deer Moat, a unique natural monument, and make the Prague Castle premises accessible via this non-traditional system of walkways. 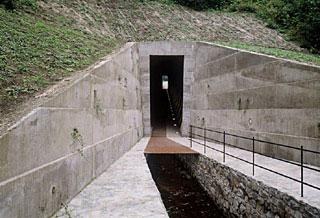 The line of the pathway is identical to that of the original Theresian Gallery (Tereziánská tola), conducting the Brusnice stream water through the Powder Bridge drainage ditch. The massive front of the new pathway was designed to allow for normal water flow to or from the existing open bed of the Brusnice stream, while at the same time facilitating connection of the existing walkways leading along the stream. Although the profile of the pathway is relatively narrow, it is significantly cambered, thereby creating an impression of weightlessness. The entire pathway is 84 m long. 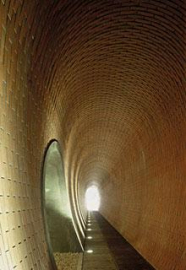 3-m sections on both sides are developed from an open excavation, while an underground tunnel accounts for the remaining 78. The broad open foreparts are between17 and 26 m in length. The portals are in the form of cambered, slightly expanding rectangles.